Abstract: The Comprehensive in vitro Proarrhythmia Assay (CiPA), led by the US Food and Drug Administration, aims to reduce unwarranted drug attrition by improving preclinical cardiac safety evaluation. A key component of the proposed assay utilizes human stem cell derived cardiomyocytes (hSC-CMs) and microelectrode array (MEA) technology to evaluate the proarrhythmic risk of candidate compounds . An initial pilot study with 8 blinded compounds demonstrated reproducible results across 10 studies. The CiPA Phase 2 study with 28 blinded compounds was established to evaluate the ability of the CM-MEA assay to assess proarrhythmic risk. The increased scale of the CiPA Phase 2 study was used as a case study in the development and validation of an automated CM-MEA assay for cardiac safety evaluation. 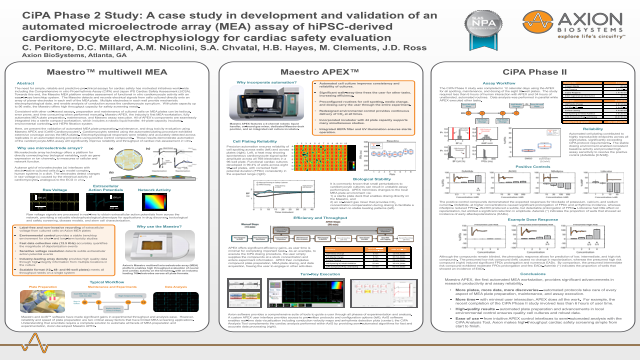 The iCell Cardiomyocyte2 and Maestro APEX automated MEA workstation were used to evaluate 28 compounds of high, intermediate, and low proarrhythmic risk in a blinded study. The amplitude and field potential duration (FPD) were extracted from the raw field potential signal for each replicate and compound, providing information on the depolarization and repolarization of the cardiomyocyte monolayers, respectively. Additional beating characteristics, such as the beating rate, variability in beat rate, and occurrence of EADs were also included in the analysis. Corrected field potential duration (FPDc) was computed using the Fridericia correction.